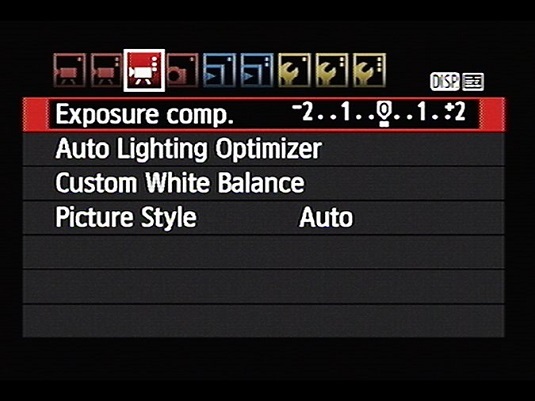 Exposure Compensation: When you set the Movie Exposure option on Movie Menu 1 to Auto, you can use the Exposure Compensation option to tell the camera to brighten or darken the scene, just as you can when you shoot still pictures in the P, Tv, or Av exposure modes. Select a higher Exposure Compensation value for a brighter picture; lower the value for a darker image. One quirk: For movies, the camera can produce an exposure shift of only plus or minus three stops, whereas you get a five-stop range for still photography. These options work just like they do for still photography. For a faster way to adjust this setting, press and hold the Exposure Compensation button while you rotate the Main dial. Either way, the indicator under the exposure meter updates to show you the amount of compensation being applied. Auto Lighting Optimizer: This feature also works just as it does for still photos. It’s enabled by default; until you have time to dig into the pros and cons of changing the setting, let it be. Custom White Balance: You can customize the white balance to match the lighting used for your movie. Picture Style: By default, movies are recorded using the Auto Picture Style. Changing the Picture Style enables you to tweak color, contrast, and sharpness. For a black-and-white movie, choose the Monochrome setting.